Markets in war-torn areas are surprisingly resilient. 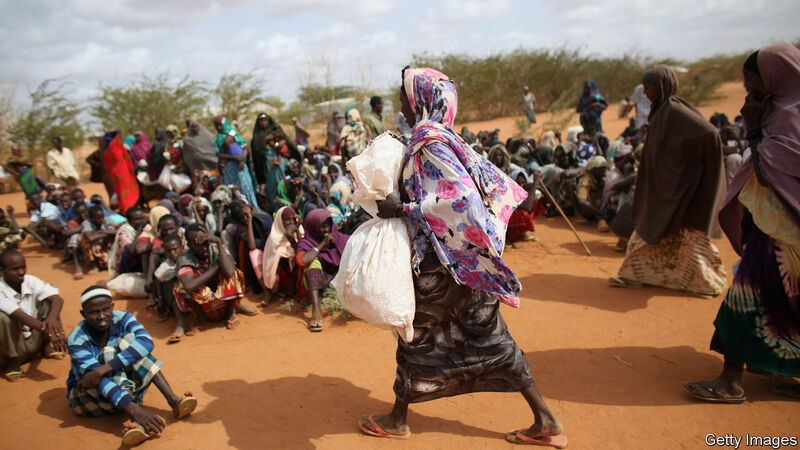 In 2011 war and drought plunged Somalia into famine. Aid was held at the border, for fear of it being stolen. A few ngos decided to try something different: giving people cash instead of bringing in sacks of food. They used hawala networks—a traditional Muslim form of money transfer—to get cash to aid workers, who handed it out. But most charities hung back, afraid of accidentally running afoul of American anti-terrorism laws. By the time drought returned to Somalia last year, the spread of mobile-money transfers meant that cash could be sent directly to phones. In April 2017 alone $35m was given out to 2.4m people (a sixth of the population). Individual merchants found ways to bring food in to supply this ready market. Famine was averted. What happened to liberation theology? Cash handouts were not the only reason: the fighting was less fierce than in 2011. But the difference between the two interventions illustrates both the efficacy and the growth of cash aid. By 2016 it made up around 10% of global humanitarian aid, up from almost nothing a decade or two earlier. In fact this understates the speed with which the new approach has been adopted, says Alexa Swift of Mercy Corps, an ngo, because the other 90% includes things that cannot be converted to cash, such as mental-health counselling. Her organisation now gives more than half its aid as cash, and other large ngos have promised to do the same. Giving cash to poor people is not a new idea. The un sends money direct to bank accounts it sets up for Syrian refugees in Jordan; many countries use cash transfers as part of their social safety nets. What is new is donors’ willingness to give out cash in war zones. Where possible, they use mobile-money transfers. But in other places, including Syria, they increasingly regard the risks that come with using hawala systems as justified by the benefits of cash. Money has many advantages over in-kind aid. Recipients can choose what they want. Studies show that most use it wisely. It helps them save, is easier to carry and supports local traders—unlike in-kind aid, which supplants them. And though vetting recipients to ensure they are not terrorists can be slow and pricey, cash aid is cheaper overall than delivering sacks of stuff. And it turns out that markets in war zones are surprisingly resilient. Take Konduga, a dusty town in north-eastern Nigeria where bullet holes pockmark the lampposts. When Boko Haram, a jihadist group, torched the main market in 2014, traders built stalls from grass mats and tarpaulins on the outskirts of town. Markets in Somalia held up through last year’s drought, says Richard Crothers of the International Rescue Committee (irc). When Islamic State’s pop-up caliphate blocked Iraq’s main north-south roads in 2014, suppliers quickly found new routes through Iran. The switch to cash requires care, says Ms Swift. Aid agencies need be alert to the risk that it causes inflation, for example. They should also seek to strengthen supply chains by rebuilding infrastructure and offering small-business loans. And they need to experiment—even if they may not always like what they find. Private traders may care less than agencies about where goods come from, and whose hands they pass through. But agencies should not let such fears hold them back, says Barri Shorey of the irc.“We know that cash works”.